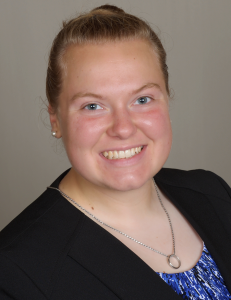 Tau Beta Pi (TBP), the engineering honor society, has named recent Iowa State University graduate Amy Kurr as a Laureate in the association’s annual program to recognize gifted engineering students who have excelled in areas beyond their technical majors. Kurr, a 2018 alumna of ISU’s Department of Materials Science and Engineering, is one of only two people nationwide to receive the award this year. Kurr was cited for her achievements in athletics: She is an international competitor and multiple award winner in the field of power lifting. She is also the founder of Ladies in Fitness Training (LiFT), an organization that encourages women to engage in sports and fitness. A focal point of this organization is to combat the bullying women may face when they engage in traditionally male-dominated sports. She was the first female member of the ISU weight club and currently holds four records each in the United Powerlifting Association women’s junior 90kg and 90+kg weight classes. During her time at Iowa State, she conducted research at Ames National Laboratory, Cardiff University in Wales and Aachen University in Germany. Kurr will be honored with other 2018 award winners at the 113th annual convention in Denver. A total of 107 Tau Bates have been named Laureates since 1982. The Laureate Program exists to further Tau Beta Pi’s mission to recognize academic and professional excellence rooted in personal integrity. The Society also promotes a well-rounded education essential for success. TBP was founded in 1885 and has collegiate chapters in 247 engineering colleges in the United States. It has initiated more than 593,000 members and is the world’s largest engineering society.